Facial flushing is part of having sensitive skin, a skin type characterized by overactive skin and blood vessels. In countries with a mostly white population, it is estimated that 3 to 10% of adults suffer from "redness " in the face (1). Nicknamed " The curse of the Celts " and (wrongly!) linked to alcoholism, this redness requires treatment, lest it become worse or chronic. 1. Redness: normal or pathological? Getting red in the face after making some excercies for two hours is normal. Irregular breathing is also to be expected. Sometimes the redness ambushes you first thing in the morning, or you might get all red after eating something spicy for lunch. But besides these everyday trials of modern life, why on earth does the face become red all over, in huge unsightly blotches? It's all because of some little blood vessels that cover the entire skin surface. Medical theories remain undecided between a blood circulation problem (the redness occurs normally but doesn't disappear when it should) and vascular hypersensitivity, which causes your skin to become red for almost no reason at all! In both cases, blood flows to the face within a precise context, and various types of redness, more or less pronounced and recurrent, become more apparent than the natural complexion. Redness is even increased with inflammatory factors in the blood, which act on specific areas, thereby accentuating the sensations of heat and redness in the face. 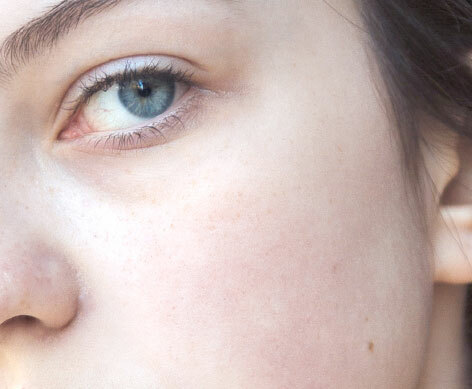 Besides the cheekbones becoming red, plaques can form on the cheeks, and tiny little blood vessels can appear on the surface of the skin on the cheeks and nose, sometimes along with little spots. Doctors and pharmacists may consider these types of redness harmless or an instant cause for alarm, but they are all referred to as " rosacea ". Unsightly appearance aside, these conditions cause discomfort and the skin feels irritated, tight and as if on fire from the cheeks to the ears. The term rosacea encompasses 4 clinical stages. At first, it's simply a case of abnormal vascular reactivity. Under the influence of various factors, such as changes in temperature, eating certain foods, or simple cases of emotional stress, brutal cases of redness can occur, which are called " flushes ". Although these flushes may be intermittent with no abnormal occurrences in between, this excess redness should not be ignored because, unfortunately, they can become permanent. The face is always red, especially the cheeks. This may simply be a case of over-sensitivity to UV rays, but most of all it's a sign of poor blood circulation in the face. Depending on the situation and on the individual, this is seen by a dilatation of little microscopic capillaries that give the cheeks an even pinkish-red color, or by dilatation of the largest vessels, visible to the naked eye, often twisted and unsightly. The inflammatory component of rosacea becomes the most significant, and spots appear, similar to the acne experienced by adolescents. In previous years, this was even called " acne rosacea ". But this imprecise term was changed to " papulopustular rosacea " to refer to the presence of red spots (papules) and whiteheads (pustules). At this stage, it is necessary to adapt treatment to these inflammatory occurrences. This is a rarer skin condition with an unsightly appearance. In addition to the blood vessels, a dilatation of the sebaceous glands is observed, most often on the nose, which then appears red, enlarged and deformed. This change almost exclusively affects men. This official classification in four clinical stages is a reminder that it can be an evolutive disease. If the condition goes untreated, it will be harder to stop it later on. In other words, it is precisely when the most benign symptoms appear, with simple "flushes" or early erytho-telangiectasia, that action should be taken. How? Using adapted dermo-cosmetic products and by eliminating elements capable of stimulating skin reactivity, such as sun exposure without protection. Stages 3 and 4 require the opinion of a doctor and a prescription for the treatments indicated. Vascular, infectious, immune... The precise origin of rosacea is still under debate by specialists. However we know that certain factors can aggravate or contribute to rosacea flare-ups, while certain habits can minimize the effects. - prolonged exposure to the sun or to tanning lamps. UVA rays provoke dilatation of the blood vessels, which can become permanent after some time. Heat also has a harmful effect: by dilating the vessels, it accentuates the effect of the UVA rays. - A sudden change in temperature. - Extreme climate conditions (cold, rain, heat, etc.). - Consumption of hot drinks, spicy food or alcohol. - Strong emotions such as anger, embarrassment and stress. - Hormonal fluctuations during phases of pregnancy and menopause. - Taking oral or topical corticosteroids that trigger dilatation of the blood vessels and thinning of the skin, gradually causing rosacea. giving preference to mild products that can be applied using your fingers, where possible from the Redness Relief range. - Choose adapted dermo-cosmetic creams that contain specific actives for redness-prone skin, and with a texture adapted to your skin type. - Before applying creams, a spritz of Thermal Spring Water will soothe and decongest the skin. - Protect the face from climatic aggressions and from the sun by applying sun protection in the summer. - For chronic redness, apply concentrated skin care morning or evening to improve microcirculation and to decongest the skin. - If the skin feels overheated, use a soothing, repairing mask. - During the more advanced stages of the condition, you should seek medical advice. No single trigger-factor. There's therefore no genetic or biological test that can identify redness-prone subjects. Despite all this, experts in the field have come up with a " composite image " for the most susceptible persons. - Persons with fair skin, light-colored eyes, fair hair and generally of Irish, Scottish or North-European lineage (Norway, Sweden, Finland). In France, rosacea is most common in Brittany (2). - These are people whose parents had rosacea. Some hereditary factors increase the risk of being affected. - Women. In 60 to 70% of cases, patients are women (3). - Young adults. Rosacea generally appears between ages 25 and 30. Then there's a peak between ages 40 and 50. Is facial flushing hereditary ? Flushing is usually seen in people with a specific type of skin called “vaso-reactive”. Like skin color, vaso-reactivity is hereditary and more common in certain countries (like Scotland). Does diet play a role? Certain situations can trigger “flushes” (redness and hot flashes). For example: food that is too hot, too spicy or eaten too quickly. No! On the contrary….Beware of sunburns and the “heat effect”. It is recommended not to stay in the sun very long and to always use a high SPF sunscreen. Is it possible to take antibiotics for over one month? Antibiotics recommended for rosacea belong to the tetracycline family. They have been out for several dozen years and physicians know their effects very well. Many people (such as acne sufferers) have been treated for several months and the good tolerance of these drugs is well established. Your physician can tell you about the possible but rare side effects. Note: Tetracycline can increase sun sensitivity (and is not indicated for pregnant women and for children). Lasers (there are several types) coagulate skin blood vessels and decrease their redness. The improvement in couperosis and chronic redness is quite noticeable. The procedure is not totally painless: There is a burning and tingling sensation during several minutes. Certain techniques (cooling, anesthetic cream) can help alleviate these symptoms.